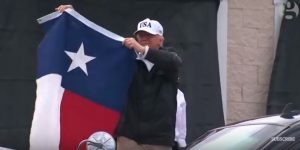 Reading time – 4:34; Viewing time – 7:40 . . .
President Trump visited Corpus Christi and held a news conference, Where he proudly proclaimed, “Thank you, everybody! What a crowd! 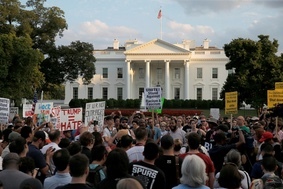 What a turnout!” thus making over 50″ of rain and widespread devastation for tens of millions of Americans secondary to the size of his crowd. As a special crowd pleaser, he waved a Texas state flag. Then he left, without visiting with any Texans in shelters, without reviewing the vast destruction and without showing any sign of caring about the people. I understand that tax reform, like everything else in the universe, is solely about Donald Trump. It’s clear that his not being disappointed is the most important thing and that the people of the United States of America are not. It’s simply and completely all about Donald Trump. So, yes, Mr. President, we do understand you. Host Joe Scarborough let us know in no uncertain terms that he’s tired of the United States playing footsie with the North Koreans over their development of nuclear bombs and ICBMs. Several presidents have tried bribery and so-called “strategic patience” to contain them and it has not worked. 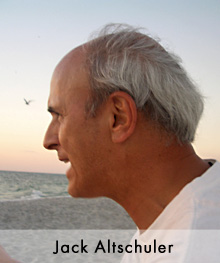 Enough of the good cop routine, says Joe. He’s sick of it. Here’s the problem with that. We’re not talking about frustration over waiting for your annoying little brother to share a toy; we’re talking about nuclear weapons that can kill tens of millions of people in an instantaneous flash. And we’re talking about an adversary led by a boy tyrant as impulsive and self-focused as our president. We ought not be posturing or playing chicken here. Scarborough’s frustration, however valid, doesn’t matter and isn’t the least bit helpful. Our cable news-addicted president might hear your words, Joe, and then tweet, “I’m hearing that some people are saying we should get tough on the North Koreans.” He might act on his impatience, his impulsiveness and his boundless ignorance and that could lead to global disaster. So, please, Joe, just shut up. In a stunning article based on their extensive research and their report, Media Bias in Terrorism Coverage, the authors unmask the ugly truth, that, “Only the attacks perpetrated by Muslims were routinely called terrorism.” Thus, the car attack in Charlottesville by a white supremacist wasn’t labeled “terrorism.” Neither was Timothy McVeigh’s bombing of the Murrah Federal Building in Oklahoma City. Or Dylann Roof’s murders at the Emanuel African Methodist Episcopal Church in Charleston. Or nearly any right wing terrorist attack. The Trump administration follows that pattern, too, so that they only label Muslims as terrorists. Got a problem with that? If you believe in the First Amendment, you should. Sen. Marco Rubio (R-FL) adeptly put a dagger into the back of the Affordable Care Act in 2016 when he championed a nearly complete defunding of the so-called cost-sharing reductions that kept insurance companies whole as the pre-existing conditions issue sorted itself out. That drove insurance companies to jack up their rates enormously or completely withdraw from many states and took medical insurance away from millions of Americans. In July, the Trump administration terminated contracts with two companies which provide in-person assistance to people to help them to enroll. Think: “Granny just doesn’t know how to navigate the internet.” And this week the Trump administration announced that it’s cutting by 90% the advertising designed to encourage Americans to get health insurance. And HHS has announced that it is dramatically closing the enrollment window for 2018. Those measures ought to be of great assistance in preventing people from signing up and, in consequence, cutting them out of medical care. Meanwhile, Trump continues to criticize the program, calling it a “disaster” and declaring that it’s “on the verge of collapse.” It’s clearly something of a self-fulfilling prophecy if the Republicans have their way with this program that has helped millions of Americans. 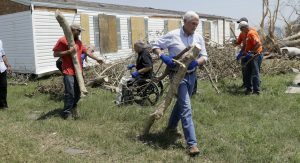 Vice-President Mike Pence visited Texas and made it a point to wear jeans and work gloves to help a homeowner remove branches of a downed tree from his property. He shook hands with and listened to several people suffering from the devastation caused by Hurricane Harvey. The only problem with that is that showing caring and empathy for the people stung by a huge disaster, being willing to dig in and help, is a leadership task that belongs to the President. President George H.W. Bush went to be with victims of Hurricane Andrew. President Clinton showed up in Arkadelphia, AR to be with the people devastated by tornadoes. President George W. Bush showed up where the Twin Towers had stood; President Obama stood with the families of Sandy Hook Elementary School and victims of Hurricane Sandy. In none of those or any other national disasters was it the Vice-President who showed up. How come it was VP Pence in Houston? Perhaps it was because Trump actually doesn’t care enough to get his hands dirty. And perhaps it was because Pence has already started running for President. 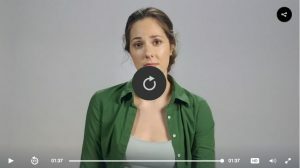 Headline: White Woman Discusses How Much She Considered Going To A Black Lives Matter Protest Once. The people of the Gulf Coast are going to need help for a long time. Tens of thousands of residents have lost everything but what they’re wearing. Tens of thousands more are and will be digging the mud out of their houses and piling onto the soggy curb what used to be their precious things, hoping that a garbage truck will show up some day. Lend a hand by CLICKING ON THIS LINK, then picking one of the do-gooder outfits dedicated to helping our countrymen. It’s our turn to help them now that it’s their turn to start over. President Trump showed up at a Houston shelter for Hurricane Harvey victims. Read Joe Biden’s short and stirring essay, “We Are Living Through a Battle for the Soul of This Nation,” because regardless of where you fall on the left-right political continuum, chances are quite good that you’ll agree that this is the kind of leadership we need. I don’t know how we’ll find the soul of our country when a soul is about “who you are”. I don’t know who are politicians are because they say all the RIGHT words but their actions don’t corroborate with their words. Having a soul means “it’s about who you are as a being”…..kindness, thinking of others, empathy….those kind of qualities and from what I see in members in this Administration aren’t any of these!! Wish they were, but it won’t happen as long as they use harsh rhetoric to define people, lie, make policies that are NEVER about people and what they need, nor can they relate to anyone else except to their “souls of money”. I think we’ve given very little attention to Louisiana’s flooding in the wake of Harvey, which was absolutely devastating. 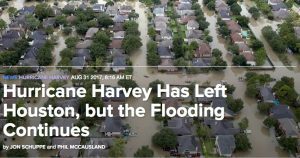 Is it my imagination or is it because there were more whites affected by the storm in Houston and more blacks in Louisiana. Correct me if I’m wrong.